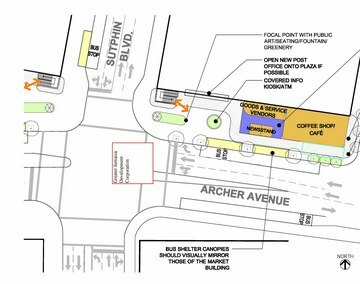 A major transit terminal with subway, bus, commuter rail and a link to JFK Airport, Jamaica Station will gain two new public plazas when the adjacent Archer Avenue is widened into a community friendly boulevard. Seeking to better integrate surrounding streets and create desirable amenities for residents and commuters alike, PPS launched the project with a community Placemaking workshop focused on improvements to the areas surrounding the station. Based on this workshop, PPS later developed the program for the new plaza spaces, including the creation of small public markets alongside them. 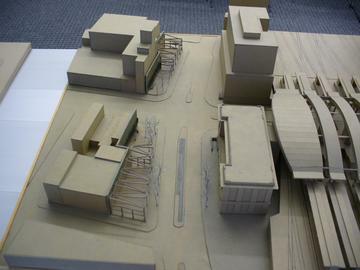 PPS analyzed pedestrian and vehicle movement patterns at the station using time lapse filming; made recommendations for design of the new boulevard; and prepared a feasibility study for the public market pavilions. The new “twin” plazas are intended to serve as an economic, social and cultural bridge between the existing immigrant and middle-class African American and Afro-Caribbean residents and business owners, as well as area workers and the newer populations of travelers and workers anticipated in Jamaica in the coming year. The plazas will serve as entrance/egress areas for the subway and provide waiting areas for transit riders in addition to gathering places for local residents, workers, and visitors. A market will anchor each plaza and build on both local demand and the needs of transit riders. 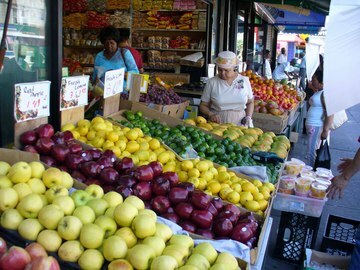 Retail uses in one market are proposed to include fresh and prepared foods, a restaurant, café, and/or coffee shop; the other market would contain a newsstand, services, and other small scale, local retail. For its design, PPS suggested that the market be open to the elements when possible, blurring the boundary between indoor and outdoor spaces yet allowing for an enclosed environment during hotter and colder months. Finally, an array of additional recommendations were proposed including infrastructural guidelines as well as management and programming options. PPS also suggested partnerships with local and city wide arts and cultural organizations as well as ways that the plazas and markets could act as an informational hub for transit users.